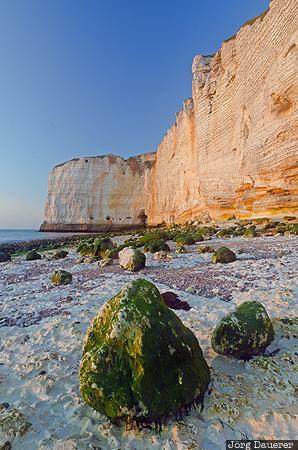 The coast near Étretat with its steep white chalk cliffs and rocks covered by green algae illuminated by warm evening light. Étretat is at the Côte d'albâtre in the Département Seine-Maritime in Haute-Normandie in northern France. This photo was taken in the evening of a sunny day in May of 2011. This photo was taken with a digital camera.